Well, I survived my first day back to work Wednesday after having 4 days off in a row. I was able to get some much needed rest and relaxation. It was so hot Wednesday with a high of 91 and I just didn't feel like heating up the kitchen by turning on the oven. I had been thinking about making Eggplant Parmesan but decided it would be too time consuming and I didn't want to use the oven and heat up the house. I had 4 small eggplants I picked up over the weekend that I wanted to use...so I decided to whip something up that I could make on the stove. I also had a leftover grilled chicken breast from the weekend that needed to be used. I cubed the eggplants and sauteed them in a little olive oil and then added a little water and steamed until tender. I diced and added the chicken breast and then poured a jar of DelGrosso Fireworks Sauce (which has a little kick to it) over the eggplant and chicken and then covered and simmered it for about 20 minutes. At the end I added 2-3 tablespoons of cream to the sauce to smooth it out and give a slight richness to the sauce without making it "creamy". 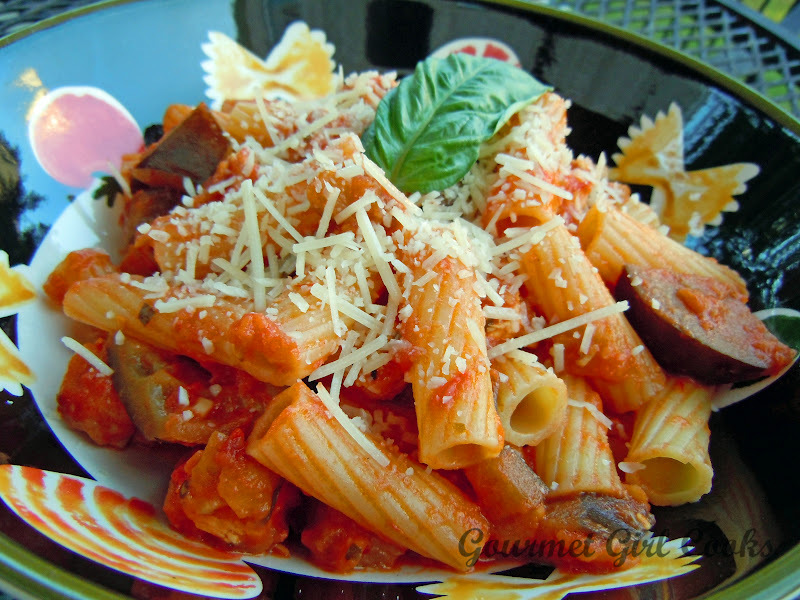 I cooked a pot of rigatoni and served the sauce over the rigatoni and then sprinkled with shredded Parmesan cheese and some freshly torn basil. It tasted like a cross between eggplant parmesan and chicken parmesan, only not as rich or heavy. It tasted amazing. I snapped a pic below to share. Enjoy! There is nothing I like better in the summer than having a bowl of cool, creamy and refreshing potato salad in the fridge to pull out as a quick side dish to accompany grilled meats or even sandwiches. It just screams summertime to me. I especially like using red potatoes for potato salad because it eliminates the part I hate most about handling potatoes....PEELING THEM! Red potato salad not only is easier to make because you don't peel the potatoes, but it is actually prettier because of the beautiful red color the skin adds to your potato salad. It also gives you a little extra fiber too. The original recipe I used as a base called for dried dill weed which I have used numerous times over the years in various potato salad recipes. However, this time I decided to substitute fresh dill instead -- what a difference it made! It gave the potato salad so much more of a fresh flavor -- fresh dill has so much more of a "clean" flavor than its dried counterpart. It also called for onion powder, garlic powder and green onions. Instead, I substituted chopped fresh chives in place of all that which also added a really fresh, mild flavor that I feel really enhanced the flavor of this potato salad. It also called for hard boiled eggs which I do not care for in my potato salad, so I omitted them as well. 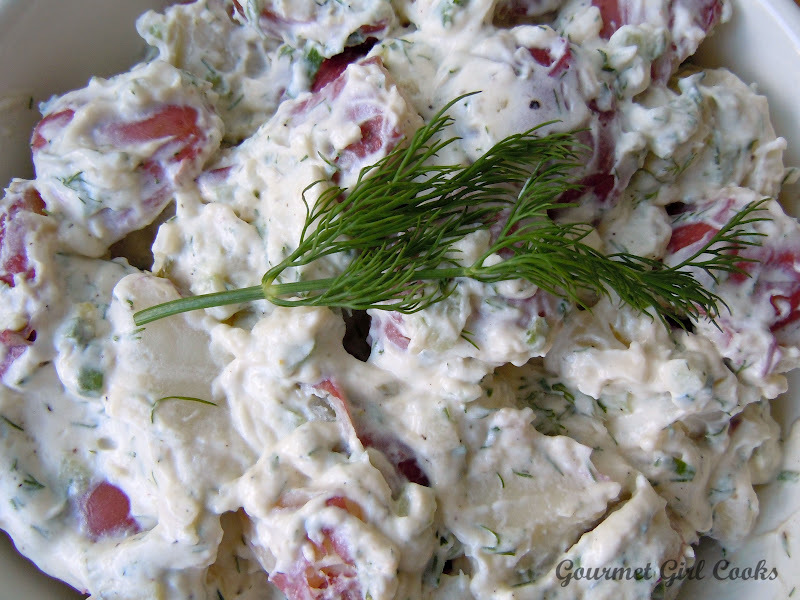 Below I've included the recipe for the Red Potato Salad w/ Fresh Dill that I made for our cookout on Memorial Day weekend. I found the basic recipe on Allrecipes and then made numerous modifications to suit my taste. It turned out delicious, cool and refreshing. I really love the "fresh" modifications. Below is a picture as well as the recipe that I re-made. Place potatoes in a pot of water (enough water to cover). Bring to a boil and cook 10-12 minutes or until just done when pierced with a fork or knife (do not overcook or they will fall apart when you toss with the dressing). Drain and spread out in a single layer on a cookie sheet to cool. Mix remaining ingredients in a medium bowl until thoroughly combined. Taste dressing mixture to adjust seasoning. Place cooled potatoes in a large bowl and pour the dressing over the potatoes and toss gently to thoroughly coat. Chill at least 4 hours in the refrigerator before serving. One of our most favorite, fun and festive desserts for summer also happens to be the most simple. 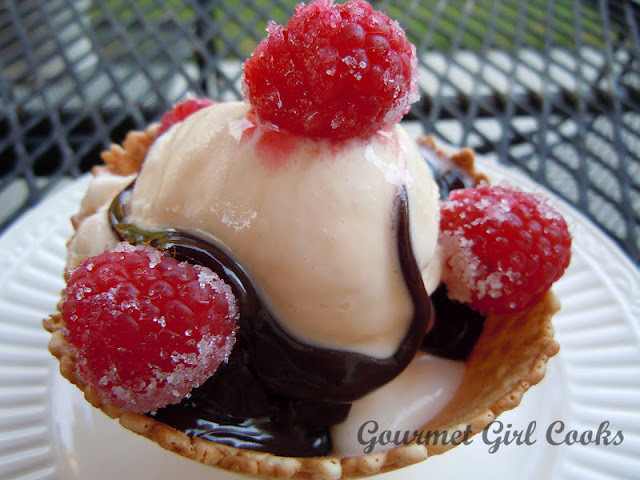 The dessert we had for our Memorial Day weekend cookout was "make your own" mini hot fudge sundaes. 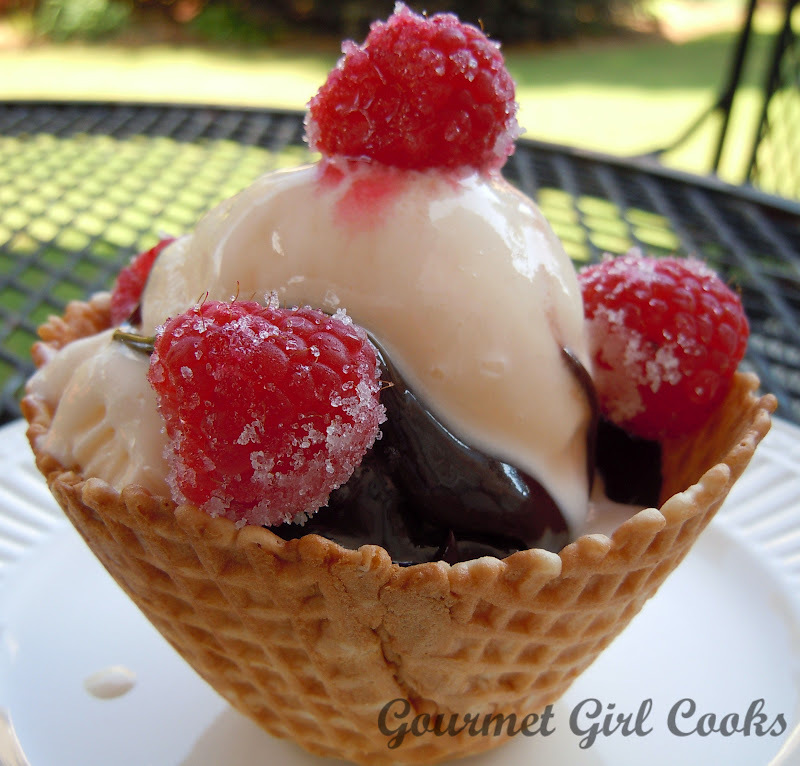 They are so easy to make and who doesn't like making their own sundae? 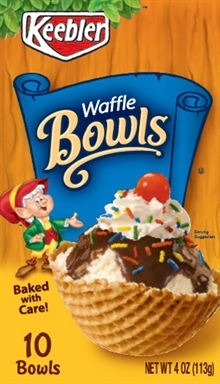 I picked up some little waffle cone bowls made by Keebler and some Smucker's Hot Fudge Sundae Sauce as well as some Heath bits (crushed Heath bars), fresh red raspberries, vanilla ice cream and vanilla frozen yogurt. The waffle bowls probably comfortably hold one large scoop of ice cream and still give you room to add your own toppings and/or sauce. It's a way to get your ice cream "cone" in a bowl...the best of both worlds in my opinion. You get to eat an ice cream cone without fear of it dripping or running down your arm! Also, it is a perfect dessert for summertime because it doesn't heat up your kitchen. I snapped a picture of the little sundae I made today...it's a scoop of Kemp's Vanilla Frozen Yogurt in a Keebler Waffle Bowl, drizzled with some Smucker's Hot Fudge Sundae Sauce and topped with a few beautiful fresh "sugar coated" red raspberries. It's not only delicious but it's also a fun way to eat your ice cream or frozen yogurt. Check out the pics below. Enjoy! this is what the package looks like! Happy Memorial Day! It's Monday and last night we had our cookout and my son and his girlfriend spent the night, which was great. We got to have breakfast with them this morning which is a rare treat. I fixed us scrambled eggs, turkey sausage, biscuits, etc. They left around noon and I got to send home lots of leftovers with them from last night's cookout. This afternoon, I decided to give my new panini pan another workout. My first paninis last week turned out good but were a bit messy because I overstuffed them. Today's paninis turned out awesome. To start out with, I bought a loaf of "unsliced" Ciabatta bread so I could cut it to the thickness I wanted. I also was careful not to overstuff them. I snapped a picture of hubby's panini -- he had a corned beef and swiss panini with a smear of honey mustard. 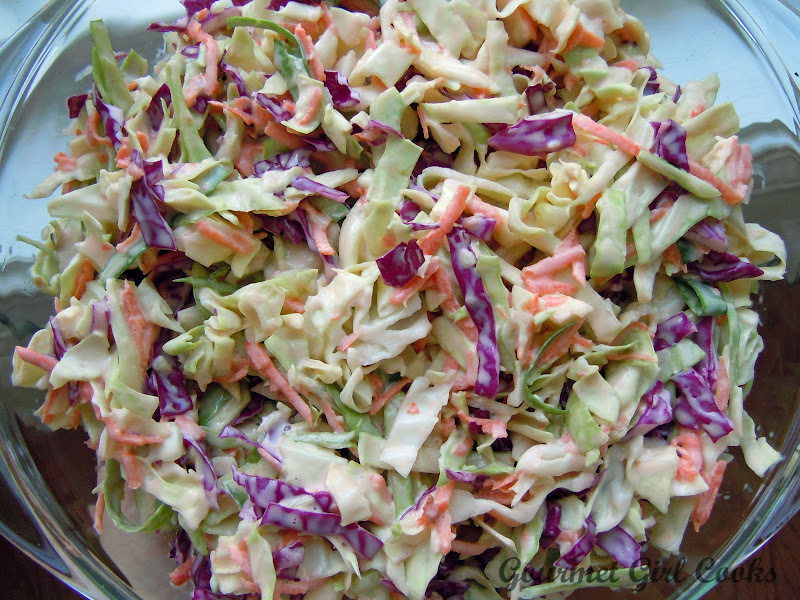 I served it with leftover tri-color coleslaw and red potato salad from last night's cookout. Check out the pic below! Sunday was a warm and sunny day here and 88 degrees. This morning, Monday, we woke to an overcast and cooler day and rain is predicted throughout most of the day. I'm glad we did our cookout yesterday! Both youngest son and oldest son and his girlfriend came for dinner -- daughter was on her way back from San Francisco so she couldn't be with us. I decided to try a few new recipes that I will share over the next couple of days. This was our menu: Grilled Rosemary Ranch Chicken, Red Potato Salad w/ Fresh Dill, Fresh Corn on the Cob, Tri-color Coleslaw and Sliders (mini-burgers on mini buns). For dessert we had Dark Chocolate Espresso Cookies and "make your own Hot Fudge Sundaes". Below I've included the recipes for the marinade for the Grilled Rosemary Ranch Chicken (I found this on Allrecipes) as well as the recipe for the Sliders (courtesy of the Pioneer Woman). Both of these turned out really good. I also have a few pics of our cookout fare below (I forgot to snap a picture of the grilled chicken after it was cooked in the marinade...but it was tasty). I'll post the recipe for the Red Potato Salad as well as the super easy Tri-Color Coleslaw some time this week. In a medium bowl, stir all ingredients (except the chicken) together until well blended. Let stand about 5 minutes. Place chicken cutlets in the bowl (or place the chicken and marinade in a large Ziploc bag and squeeze out all the excess air. Refrigerate at least 30 minutes. (I marinated about 4 hours). Preheat the grill to medium-high heat and add chicken to the lightly oiled grate. Cook about 4-5 minutes on each side until no longer pink and juices run clear. Preheat the grill to medium heat. Mix the ground beef, heavy cream, Worcestershire and salt and pepper in a bowl. Use your hands to thoroughly mix the ingredients. Form 1/4 cup of the meat mixture into patties, making 16 patties total. Make an indentation with your thumb in the top center of the patties to keep them from plumping up too much when they cook. Grill the sliders until just cooked through, 2 to 3 minutes per side. Remove from the grill and pile on a platter. Toast the halved buns on the grill if desired. Serve immediately. It is Saturday and this evening, youngest son came for dinner. I made a pasta dish using DeLallo Organic Whole Wheat Farfalle (bowties), DelGrosso Fireworks Sauce, Aidells' Italian Smoked Chicken Sausage w/ Mozzarella, grilled Perdue boneless chicken breasts, sliced mushrooms and sliced zucchini -- whew, that's a mouthful! 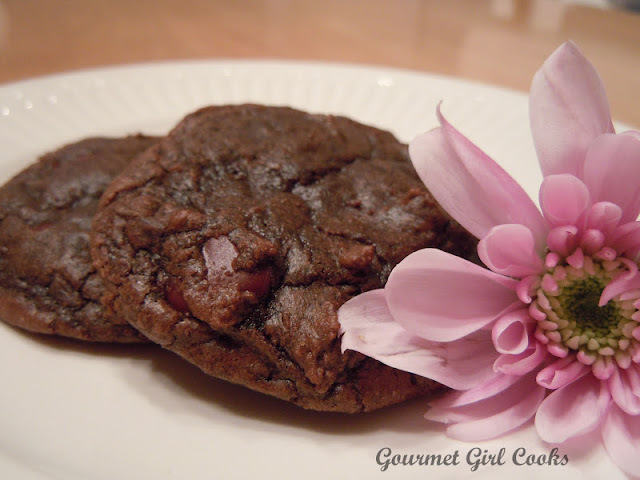 I also made Dark Chocolate Espresso Cookies for dessert. I'll post the recipe for those tomorrow! Below are a couple pics of our dinner this evening. Enjoy! Well it is Saturday and it is hot here today -- 91 degrees....yuck! This past week was such a busy week and I am so glad to have a long weekend ahead to recuperate. I received several items this week that I ordered and am excited to share. I finally bought a new set of pots and pans....I have hemmed and hawed for years and just couldn't justify paying a couple thousand dollars for the set I really wanted (All-Clad's Copper Core). But I did find another set that I really liked made by Calphalon. It is their tri-ply stainless steel line. I am looking forward to unpacking them and trying them out this weekend. Another item I bought was a Calphalon panini pan that you use on the stove (not the kind that is its own appliance). I tried my panini pan out Thursday night. I made hubby a reuben panini and myself a chicken-philly panini. Unfortunately I didn't take any pics...I wish I had. What I learned was that you shouldn't over stuff your sandwiches when you make paninis...because it sort of oozes and spills out when weighted with the heavy panini press. 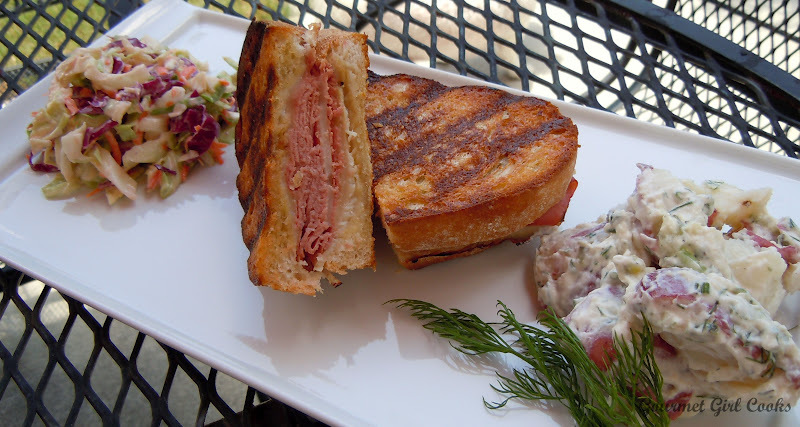 While my first paninis may not have won any beauty contests...they definitely would have won a taste contest! It made the most crisp sandwich crust ever and since they are lightly brushed with olive oil before cooking it and the bottom of the panini pan is ridged, it is not greasy like a grilled cheese sandwich can sometimes get. 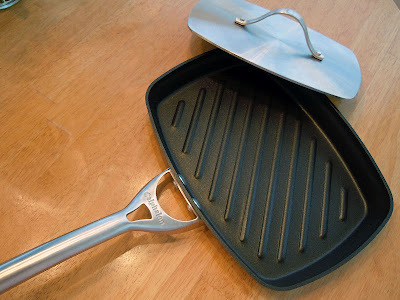 You could also use this pan as a grill pan too. I snapped a pic of my new panini pan below. I look forward to making simple sandwiches a bit fancier by converting them into paninis. You can check out my new Calphalon panini pan below. Even though you can't tell by looking at the picture, the panini press is heavy!!! Picked these up this morning -- hope they are good! Baby eggplants...can't wait to use these! New flavor of k-cups -- Macadamia Nut Cookie! Another new flavor of k-cups -- Donut Shop Coconut Mocha! Well, it is Tuesday and as I write this post, the sky has become black and there is thunder rolling in and the trees are blowing all over the place. Looks like we are going to get another big thunderstorm like we got yesterday. This evening I was in the mood for a main dish salad for dinner. I made hubby and I huge salads filled with fresh romaine, carrots, cherry tomatoes, shredded parmesan cheese and chunks of breaded chicken tenders. I decided I wanted to whip together my own vinaigrette type dressing and just kind of made it up as I went. I whisked together extra virgin olive oil, red wine vinegar, dijon mustard, honey, grated parmesan and then spiced it up by adding some sea salt, cracked black pepper, cayenne pepper, seasoned salt, dried buttermilk dressing herbs, onion powder and garlic powder. I kept playing around and adjusting it until it tasted yummy. I must say...it was pretty darn tasty! I snapped a pic below to share. Enjoy! I promised to post the recipe for the fresh fruit tartlets my daughter made for Mother's Day. The recipe is a Paula Deen recipe for a large fresh fruit tart that was modified to make bite-sized tartlets made with store bought shells (the filling ingredients are identical but 1.75" tartlet shells were substituted in place of the crust part of the recipe). These made "1-bite size" little tarts that are really cute. The tart shells are made by Clearbrook Farms and the also make a 3" size as well. To save time, you could also use a store bought ready made crust that is already baked or cooked since the tart does not get baked. You could substitute a graham cracker crust too or your favorite tart or pie crust recipe. The key thing is that your crust has to be cooked before adding your filling and fruit. To save time, you could also take a short-cut on the glaze by melting apple or apricot jelly and glazing the top by brushing that on with a pastry brush instead of making a glaze. There are numerous ways to easily modify or simplify this recipe, depending on your preference and time. Hope you enjoy! Keep the tart in the refrigerator. Remove about 15 minutes before serving. Today was an absolutely gorgeous "top 10" day here. It was in the 70s, breezy, sunny and the kind of weather I would love to have all year long! We ran our errands bright and early this morning with our Einstein's bagel stop for breakfast and then Costco and Publix. I was planning to make pizza for dinner tonight and was so disappointed when we found the Publix fresh pizza dough was FROZEN solid as a rock! So, I figured we'd have to switch gears and make something different. When we got home, I couldn't stop thinking about how I really needed to just make my own pizza dough. I know that it wouldn't be hard to do...but it does require a bit of planning ahead because most pizza dough needs time to rise, etc. and you need to either make it the day before or hours ahead of time. In other words, it isn't a spur of the moment kind of thing. After surfing around online for a while, I found what looked like an easy yeast based pizza dough recipe that didn't require much advanced preparation. So, I decided to go for it and give it a try...of course I modified it a bit "because I could". :-) . This recipe is so simple and quick to make that I might just have to say bye-bye to Publix fresh pizza dough! It literally only took about 5 minutes to put together. (During the 10 minutes the yeast activated in the water, I measured out the rest of my ingredients). You are supposed to be able to use this dough after it has sat for 5 minutes...but I let it double in size which only took about 30 minutes (and during that 30 minutes I cut up all my toppings...red peppers, onions and mushrooms for me and pepperoni, artichokes & Kalamata olives for him). I must say, the pizza crust was absolutely delicious! I may even try adding some Parmesan cheese to the dough next time. 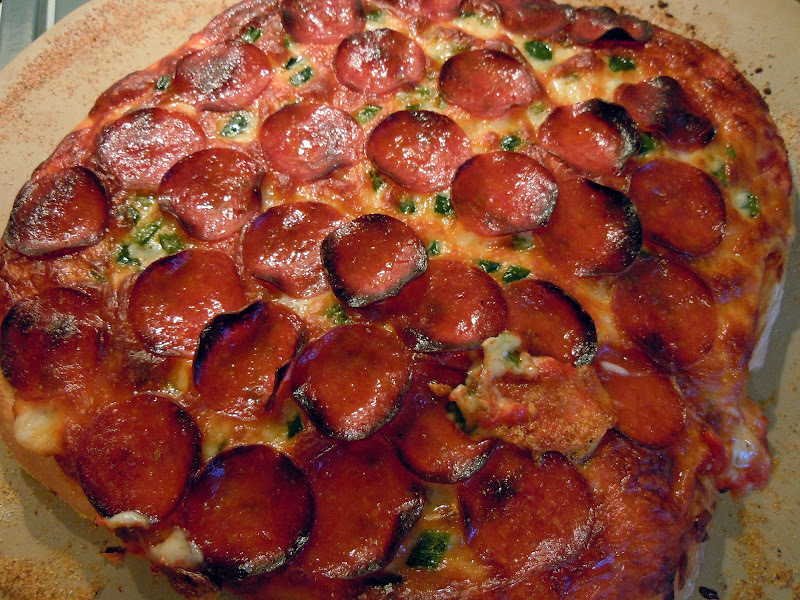 The addition of herbs, onion and garlic powder really kicked this dough up a notch. I found this dough very easy to work with too. If you keep your counter or work surface and rolling pin well floured, it is a breeze to roll out. It made a huge 16" pizza crust -- almost too big for my pizza stone. It would easily make 2 medium sized pizzas, depending on how thick you like your crust to be. I snapped a few pics below as well as the recipe for the pizza dough. Enjoy! Fresh out of the oven...the fresh mozzarella looks delicious! 1. Preheat oven to 425 degrees F. In a medium bowl, dissolve yeast and sugar in warm water. Let stand until creamy looking, about 10 minutes. 2. Add and stir in flour, salt, Italian seasoning, onion powder, garlic powder and olive oil to the yeast mixture. Mix well until smooth (form in a ball and cover bowl with a towel or saran wrap). Let rest for 5 to 30 minutes. 3. Turn dough out onto a lightly floured surface and pat or roll into a round or the shape of your pan. Transfer crust to a lightly greased pizza pan or cornmeal dusted pizza stone. Spread with sauce, cheese and desired toppings and bake in preheated oven for about 20-25 minutes, or until golden brown. Let baked pizza cool for 5-10 minutes before serving. This evening I got home late from work and decided to make something quick for dinner. I had a pack of Pasta Prima Grilled Chicken & Cheese Ravioli in the fridge and an open jar of DelGrosso's Vodka Sauce that I decided would go great together. Hubby picked up a few zucchinis on his way home that I diced, quickly sauteed and then simmered in the sauce while I made a salad to go with our meal. It turned out awesome...and you would never know it only took about 20 minutes to make. 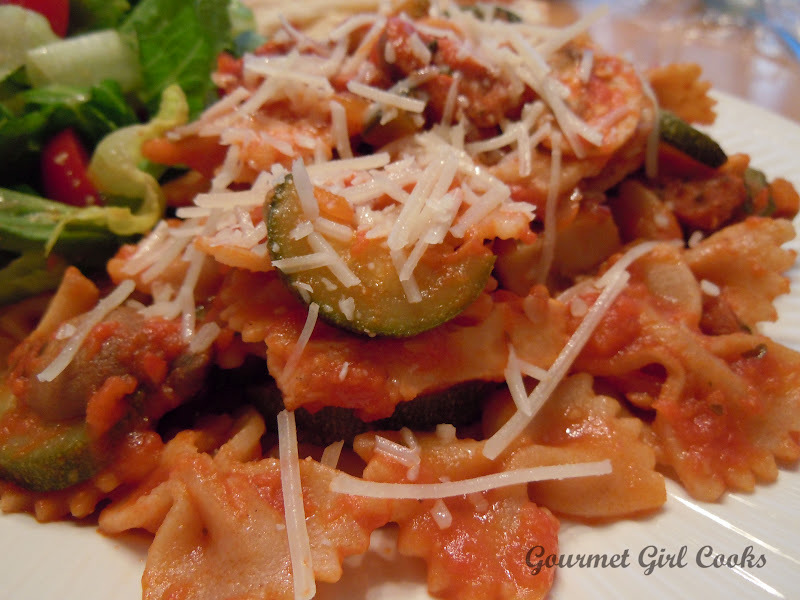 I carefully overlapped the huge triangular ravioli down the center of our plates and then poured the zucchini filled Vodka sauce over them and topped with shredded Parmesan cheese. The meal was delicious and easy to make...and the best part of all is that I got to eat in my nightgown after a really long day -- any meal I can eat dressed like that is MY KIND OF MEAL! ;-) I snapped a pic below for you to see (of the food, that is...not me in my nightgown...hahaha). Enjoy! My oldest son and his girlfriend brought me some beautiful bright yellow flowers...they are absolutely gorgeous! Check them out below! First I must say...Happy Mother's Day to my Mom...you are the best! Next I want to wish all the other Mommy's of the world a very Happy Mother's Day too. Later today, my kids are coming over to take me to dinner and my daughter is making a "surprise dessert". It's a rainy day here and I got to sleep in late this morning (which is awesome). I just finished my quick brunch omelet that I quickly whipped up for myself as well as an awesome cup of Rainforest Espresso with Cinnabon creamer. The coffee wasn't just fantastic...it wasn't just fabulous...it was FANTABULOUS! I snapped a few photos below. 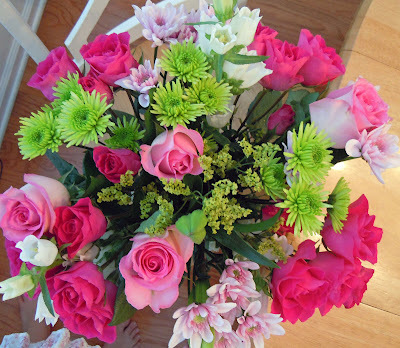 Enjoy and Happy Mother's Day! Ahhh...this cup of coffee is awesome! Adding this to my morning espresso made me feel like I was drinking a creamy cinnamon roll! It's Saturday and hubby and I ran our usual errands and stops today...Einsteins for power bagels & coffee and our weekly Costco stop. Since we had pizza for dinner last night and our leftover pizza for lunch this afternoon, I decided we'd have big main dish salads tonight filled with romaine, Cherubs tomatoes, carrots and sliced chicken tenders along with my Easy Cheesy Bread. I just sort of stumbled on the cheesy bread by accident recently by trying to figure out a way to use a leftover ball of Publix fresh pizza dough that needed to be used. So I thought I would try making a cheesy bread roll that would help use up all the partially used bags of different shredded cheeses in my cheese drawer. I had some mozzarella, sharp cheddar, parmesan, and monterey jack. I figured if it turned out awful, then I'd just throw it out...but the amazing thing was it turned out absolutely wonderful!!! Below is the simple recipe to make my Easy Cheesy Bread as well as a few photos. Line a cookie sheet with foil and lightly spray it with Pam cooking spray or brush lightly with olive oil. Place ball of dough in the middle of your prepared cookie sheet and begin pressing it out with your fingers (or you can roll with a floured rolling pin if you prefer) until it is an oblong oval shape approximately 12-14 inches long and about 8-10 inches wide (this is not an exact measurement). After your dough is in an oblong/oval shape, spread your shredded cheese on top covering the entire surface; sprinkle with Italian seasoning (to taste) and red pepper flakes (to taste). Take the longer edge of your cheese covered dough and begin rolling it over (so it will be long when rolled up similar to the shape of a baguette/French bread). Press the edge/seam tightly so it won't come open when baked. Gently curve your bread roll (or you can leave it straight) and make sure it is seam side down on your cookie sheet. Lightly cut several slashes crosswise (3 or 4) on top of the loaf so steam can escape and a little cheese can gently ooze out. Place in a 400 degree oven for approximately 25 minutes until lightly golden brown and bread feels done. Let the bread sit for about 5-10 minutes before cutting. Slice and enjoy! This is our dinner salad...fresh and yummy!